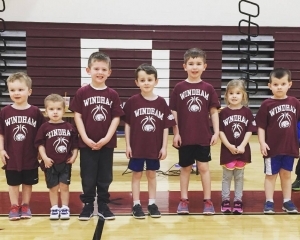 The Windham Youth Basketball Association (WYBA) is one of the largest youth basketball organizations in the state of Maine with over 450 participates annually. WYBA exists to provide an opportunity for boys and girls to compete in an environment that emphasizes fundamental basketball skills, teamwork, good sportsmanship, and the development of a healthy positive attitude. WYBA is a non-profit organization run by the volunteer mothers and fathers of current and past WYBA players and supported by the generous contributions of community sponsors. The organization provides recreations level competition as well as travel basketball and skills training for boys and girls grades Pre-K to 8th grade. Under the direction of its volunteer board of directors, and coaches, WYBA coordinates the following basketball opportunities for recreation and travel level basketball in the Town of Windham. In addition to our Winter activities listed above we host the Annual Sonic Coed 3on3 Basketball Tournament which has become a very popular event that many families look forward to. Our funding comes from player registration fees, corporate sponsors and fundraising. We annually work to raise money to improve the basketball facilities and equipment in the town of Windham. WYBA has donated playground basketball systems to the Windham Primary School, Manchester School and Recreation Department as well as backboard pads, scoreboard supplies and other equipment to improve the playing experience in our community.